Edison and Swan United Electric Co.
Coiled carbon filament (intact) housed in clear glass globe. 'Bayonet' cap consists of cylindrical brass collar and ceramic base through which platinum wires, insulated from brass and each other by vitrite, connect two ends of filament to power supply. Filament incandesces when current passes through it providing light. Bulb either evacuated or filled with inert gas encapsulates filament to prevent it oxidising. Markings - 220-16-A1 suggest lamp operates at 220V, candle power 16 and draws current 1 Amp. 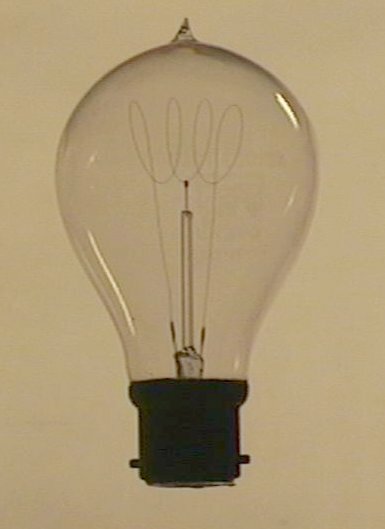 Carbon filament lamps were first practically produced independently by T.A. Edison in the USA and J.W. Swan in England between 1878 and 1880. They provided the solution to the "division of light" problem - that of having small amounts of lighting in different locations without the need to co-locate a power source with each lamp and without excessive transmission line losses. The high resistance of the filaments (i.e. 100 ohms plus) allowed energy to be distributed at high voltages with only low current required to provide sufficient power and thus minimal power loss through copper wires connecting lamp and source. These lamps dominated the market for some 20 years until 1904 when the General Electric Company of America produced the metallised carbon filament lamp, and the highly refractory properties of tungsten began to be realised. 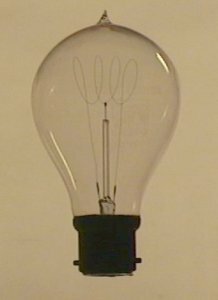 The Edison and Swan United Electric Company Ltd arose in 1883 when a lawsuit regarding British patents concerning carbon filament lamps resulted in a merger between Edison's and Swan's English companies. R. Glazebrook (Ed), Dictionary of Applied Physics, Vol. II (1922), Macmilland & Co., Ltd., London, pg379-381.